This technique’s objective is to prevent the transmission of inherited diseases. It is useful when there are previous chromosomal or genetic disorders in the family and within the context of in vitro fertilization programs. Can be performed either on the eggs or on the embryos, the latter delivering the best results. 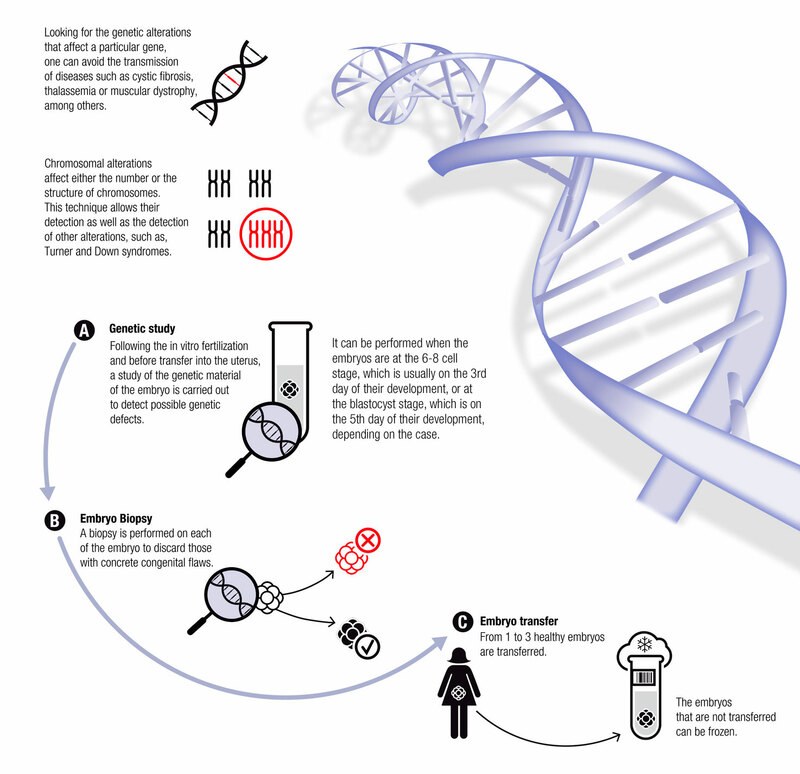 The PGD or Preimplantation Genetic Diagnosis is a laboratory technique that allows studying the DNA of eggs or embryos to select those that meet certain characteristics and / or exclude those with certain hereditary disorders. This technique is especially useful when there is a history of genetic or chromosomal disorders in the family. We study the embryos prior to transferring them to the uterus. This study is carried out at our laboratory once fertilisation IN VITRO has taken place. This study is performed when the embryos are either at the 6-8 cell stage, which is on the 3rd day of their development, or at the blastocyst stage, which is on the 5th day of development, depending on the case. A biopsy of each of them is done and those with a particular genetic disorder are discarded leaving only the healthy embryos to be transferred into the uterus. The genetic diagnosis of eggs allows us to detect genetic or chromosomal disorders in eggs before the embryo is formed. This technique analyses a specific part of the egg, the polar body, so it can only detect inherited diseases of maternal origin. In order to study the mature egg a polar body biopsy is carried out by making a small opening in the zona pellucida that surrounds it. Having identified the normal eggs, they are inseminated by Intracytoplasmic Sperm Injection (ICSI) thus obtaining embryos suitable for transfer to the uterus.